Bennett Brinson Gamel: Fighting Cystic Fibrosis: Bennett's little buddy, who wants to save his life. Bennett's little buddy, who wants to save his life. A few months ago, I approached Oliver's school to see if they wanted to participate in the Cystic Fibrosis Foundation's school-based fundraiser program, Cure Finders. This program teaches about Cystic Fibrosis and encourages children to bring coins to school to raise money for CF. I thought this would be a wonderful opportunity for the school to learn about more Bennett's condition. In Oliver's school, there are two families who deal Cystic Fibrosis. Oliver and the other student are both brothers/siblings of children who have Cystic Fibrosis. Oliver's school agreed participating in this fundraiser would make alot of sense for the school community. So, this week the school dedicated a week to focusing on the fundraiser with hopes it can raise more than one thousand dollars. We were hoping Oliver could be really involved with the fundraiser in his Preschool Class but he has turned out to be sick all week so we are missing all the fundraising efforts completely. "We went ahead this morning with [showing] the [school community] Bennett's video [without Oliver there]. Your heartwarming and very well made video was well received by children and adults alike. It seemed to quietly inspire many of our community to work to reach our fundraising goal. More importantly, though, it was very helpful in just bringing the realities of CF to the minds of our children and inspiring in them a desire to do what they can to help. A poignant example is the attached journal entry today from little Cody B. from Kindergarten. He wrote and drew this entry in response to the prompt of writing about something he wants to do. Our school’s very talented and deeply devoted Kindergarten teacher was very moved and impressed and shared it with us. I thought you’d want a copy too." When I received this email and opened the attached picture drawn and written by a Kindergartener at Oliver's chool, I was moved to tears. I don't even have words for this picture. It is incredibly beautiful. I have never before had a child express his desire to help us find a cure for Bennett. So, for this to be the first opportunity for me to hear this from a child that I know is incredibly powerful. It shows that children are listening and learning around their environment. I would have never believe that Bennett's video have such an impact of any of the students. Cody drew Bennett almost perfectly to what he saw in Bennett's video - Bennett with his mask and vest. Cody drew himself holding three dollar bills. 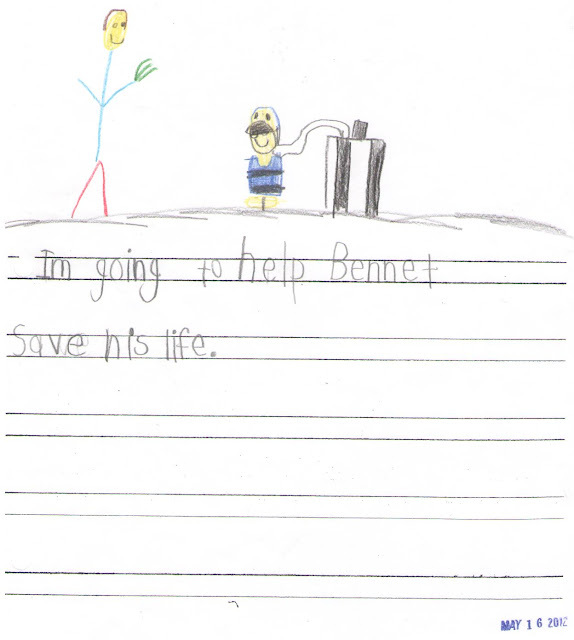 The words "I'm going to help Bennett save his life" are so poignant. I cannot even express how much I appreciate this journal entry. It is a peek into the world of a child and makes my heart so very tender. This might be my favorite post ever! The picture is perfect! My husband, Bryan, is an elementary school PE teacher. After Bryce was diagnosed he ended up getting his school to participate in Cure Finders also. Great program! The first year he did the fundraiser the kids at his school brought in over $6000.00 in one week. They did "Jar Wars". All the classes in the school competed against each other to see who could bring in the most money. Monday they brought pennies, Tuesday - nickles, Wednesday - dimes, etc. Amazing! Anyway - that year in GA, Chipper Jones of the ATL Braves was the Cure Finders celebrity spoke person and since Bryan's school raised the most money in GA for the Cure Finders program they got a visit from Chipper. Bryan's school ended up winning the Cure Finders again the next year as well getting another visit from Chipper. They changed the program here in GA so now Bryan still does the "Jar Wars" fundraiser at his school, but we run everything through our Great Strides team. I hope the fundraiser went well. I'm sorry you guys missed out on it...hopefully little man is feeling better. Thanks for sharing. Loved this! Breck -- this is amazing. I am SO overwhelmed with emotions today. I thank the Lord each + everyday for the amazing gifts he's given to us. I'd love to reach out to my children's schools (West Elementary + Middle School) to see if we can put together something for Bennet too. I'm sure it would be well received. I also LOVE the idea of the JAR WARS! That sounds like so much fun. This too, is one of my favorite posts of yours. It touched me so deeply thinking of the depths of this child's compassion, at a mere five or six years of age. I can't imagine how you must of felt, as the mother of the boy being "saved". This is also the first time I've heard about 'Cure Finders', and although I am in my senior year of high school (it may be a little late to adopt this program within my school), my little brother is in elementary school, and he has CF as well. It will definitely be something I'll look into. Thank you for sharing! I hope Oliver is feeling better.